The Louisiana Bankers Education Council has awarded their annual college scholarships thanks to the generous support of LBA members. Each fall, LBEC offers cash scholarships to incoming freshmen who have at least one parent employed with a bank or if the student is employed with a bank in Louisiana. The students must enroll in an accredited Louisiana college or university with a declared major in a banking related field. For more information on the scholarship, click here. 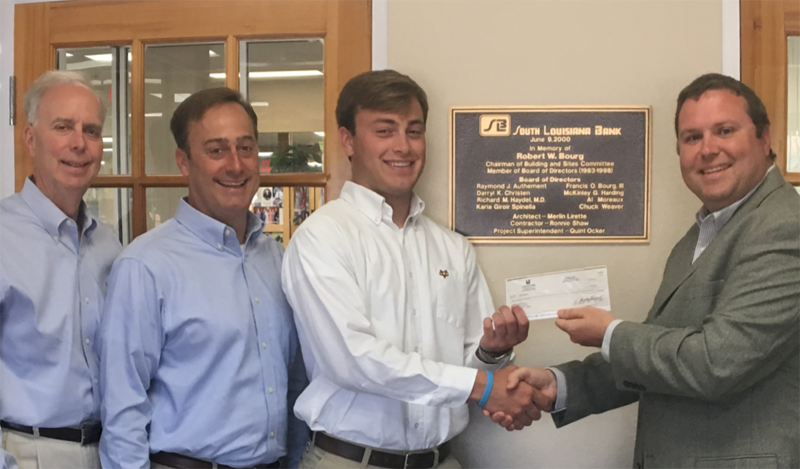 (from right) LBEC Councilman at Large Ryan Haydel of Pedestal Bank presents a LBEC Freshman Scholarship to Jules Weaver as his father Chuck Weaver, Jr., and grandfather Chuck Weaver, Sr., both of South Louisiana Bank, look on. (second from right) LBEC Membership Chairman Mallie Bowers of First Federal Bank of Louisiana presents a LBEC Freshman Scholarship to (middle) Logan Moore as (remaining, from left) his mother Sharamie Moore, father Mike Moore of First Federal Bank of LA in Lake Charles and Drew Pierson of First Federal Bank of LA look on. (from right) LBEC Membership Chairman Mallie Bowers of First Federal Bank of Louisiana presents a LBEC Freshman Scholarship to Darrin O’Kief Nixon, Jr., as Tabitha Nixon of JD Bank in Lake Charles looks on. Congratulations to ICBA Chairman Preston Kennedy! Congrats to the Leadership School Graduates! Louisiana Bankers Gather for State Night during 2018 Graduate School of Banking! LBA Participates in Flood Insurance Briefing in D.C.
Congratulations to the 2017 Leadership School I Graduates! Thanks to Red River Bank for Bringing Ice Cream to LBA Staff! LBA Wishes You a Happy Mardi Gras!